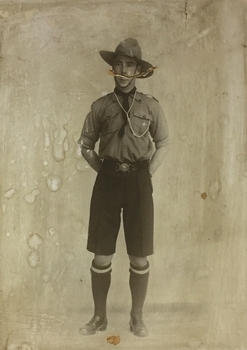 Large sepia photograph of a 1st Kew Scout in uniform. Given that it is a large-sized studio photograph that had been framed and kept for decades, it is likely to be one of the founders of the Scout Troop, perhaps Captain Peowrie. Like many of the early Scout Troops, a man with a military background initially led 1st Kew. Having joined the Scout Troop in 1911 or early 1912, Captain Peowrie went on to serve in the Army during the First World War, rejoining the Scout Troop at war’s end. He went on to be the Scout Leader and later Group Leader up until 1930, whilst also serving as acting District Commissioner for Kew and Deputy Chief Commissioner of Victoria. The first Kew Festival was in 1974. Since then, it has been held annually. The volume formed part of the professional library of the historian Dorothy Rogers. Book of stories, jokes and cartoons sourced from international newspapers and magazines and published locally in 1934. 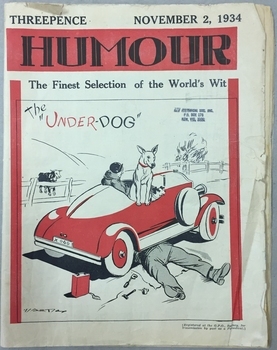 Cover: "Humour, The Finest Selection of the World's Wit. November 2, 1934. Price 'Threepence'. Registered at the GPO Sydney for transmission by post as a Periodical"
A print made by/for Dorothy Rogers in the 1960s from an original in the La Trobe Library (State Library of Victoria) showing one of the trains on the Outer Circle Railway. 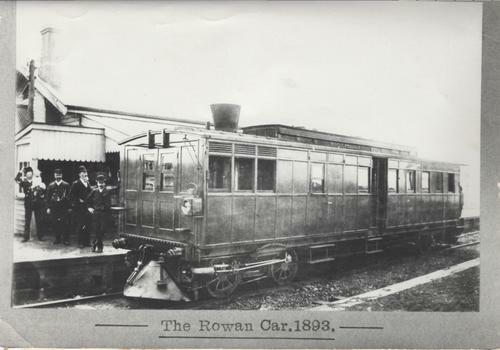 "Train used on Outer Circle Railway 1893. 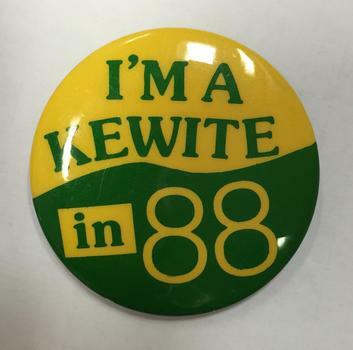 Only ones available supplied by La Trobe Library"
Dorothy (1926-) and Dr. Laszlo Benyei (1920-2006) became members of the Kew Historical Society in 1980. Laszlo and Dorothy were both key members of the Management Committee of the Society, Dorothy performing the role of Society Archivist 1983-2013. During this period she was to be a Founding Member of the Friends of Villa Alba, was active in raising funds for Hamer Court and the main organiser of the Historical Society’s contributions to the Bicentennial on 1988. The archive file contains correspondence, biographical material, newspaper articles/clippings, and printed ephemera. The Riversdale Estate in Hawthorn created a subdivision of 20 allotments bordering on Riversdale Road and Riversdale Court (which was created by the subdivision). The Locality Plan at right lists the major public buildings in the area: Burnely Horticultural Gardens, Hawthorn Tram Depot and Railway Station, Scotch College and the River Yarra and The Boulevard. The Kew Historical Society collection includes almost 100 subdivision plans pertaining to suburbs of the City of Melbourne. Most of these are of Kew, Kew East or Studley Park, although a smaller number are plans of Camberwell, Deepdene, Balwyn and Hawthorn. It is believed that the majority of the plans were gifted to the Society by persons connected with the real estate firm - J. R. Mathers and McMillan, 136 Cotham Road, Kew. The Plans in the collection are rarely in pristine form, being working plans on which the agent would write notes and record lots sold and the prices of these. The subdivision plans are historically significant examples of the growth of urban Melbourne from the beginning of the 20th Century up until the 1980s. A number of the plans are double-sided and often include a photograph on the reverse. A number of the latter are by noted photographers such as J.E. Barnes. 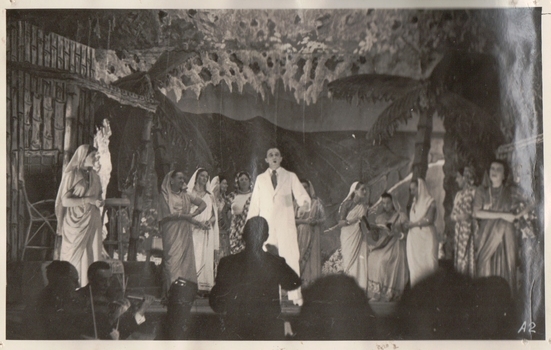 The Kew Light Opera Company was formed in 1952, and mounted a number of musical and variety productions each year until it was subsumed in the "Q" Theatre Guild in 1957. A partial record of performances by the company includes: 1952 Florodora, 1953 The Cingalee - San Toy or The Emperor's Own, 1954 While the Sun Shines - A Country Girl - Our Miss Gibbs, 1955 The Toreador - The Arcadians, 1956 The Maid of the Mountains - Whiteoaks - Goodnight Vienna!, 1957 A Country Girl. Most of the Company's performances took place in the Kew Recreation Hall in Wellington Street, Kew. The scrapbook of annotated photographs, programmes, and newspaper reviews of which this item is a part was assembled by Marion Tilley, wardrobe mistress for, and performer in, productions by the Kew Light Opera Company and the "Q" Theatre Guild. 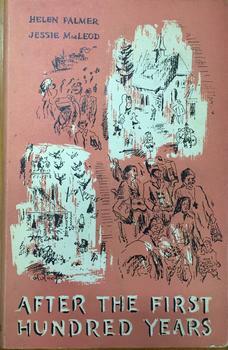 It is significant as a remarkably complete document of theatre performances in Kew, Victoria during the 1950s and 1960s. The scrapbook, and the items individually catalogued within it, have artistic and aesthetic significance within the history of performing arts in Victoria in the middle of the 20th Century. They have social significance in that they reveal socio-cultural values and preoccupations during the period. The records also act as a history of arts activities in the Kew Recreation Hall and later in the Kew City Hall as entertainment and community arts and music precincts. 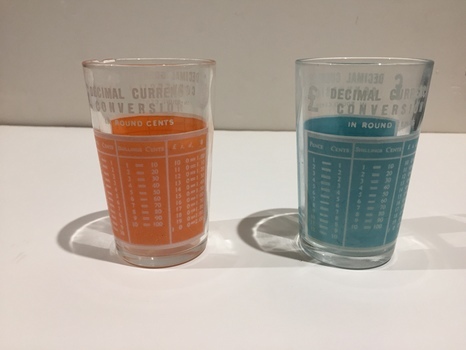 Pair of transfer printed glasses with decimal currency converters printed on them. Presumably made around the time that Australia switched from Imperial to Decimal Currency in 1966 to aid the householder make quick conversions. A hand-drawn subdivision plan listing six blocks bounded by Houghton Street, Doncaster Road, Buchanan Avenue and Maud Street, North Balwyn. 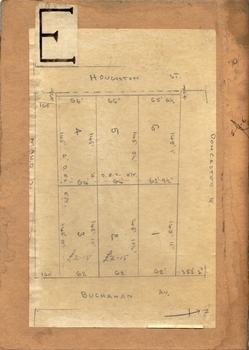 Written on the plan of subdivision are the lot numbers, the dimensions of the blocks and the price at which two lots were for sale or had been sold for. Pru Sanderson, in her groundbreaking ‘City of Kew Urban Conservation Study : Volume 2 - Development History’ (1988), summarised the periods of urban development and subdivisions of land in Kew. The periods that she identified included 1845-1880, 1880-1893, 1893-1921, 1921-1933, 1933-1943, and Post-War Development. These periods were selected as they represented periods of rapid growth or decline in urban development. An obvious starting point for Sanderson’s groupings involved population growth and the associated economic cycles. These cycles also highlighted urban expansion onto land that was predominantly rural, although in other cases it represented the decline and breakup of large estates. A number of the plans in the Kew Historical Society’s collection can also be found in other collections, such as those of the State Library of Victoria and the Boroondara Library Service. A number are however unique to the collection. 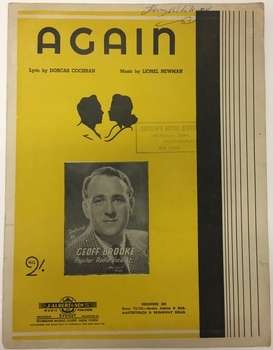 Sheet music for the song Again, featuring a cover photograph of the Australian 'radio star' Geoff Brooke. 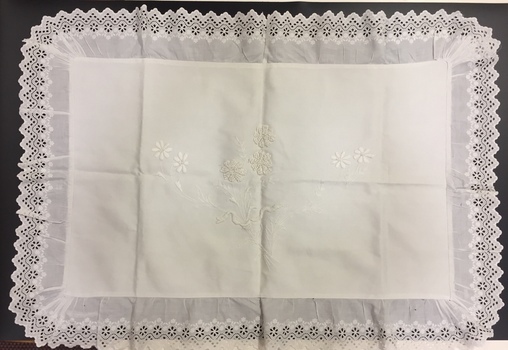 Brooke, a resident of Wellington Street (Kew), was a close friend of the singer Robin Vanser (aka Robin Kelly The item forms part of the Vandersluys-Kelly Collection of performance memorabilia donated by her to the Kew Historical Society in 2018. The Vandersluys-Kelly Collection of photographs, costumes and musical performance memorabilia was donated to the Kew Historical Society by Robin Denise Kelly in 2018. The collection is an important record of stage and recorded performances in Australia in the second half of the 20th century. This new nationally-focused and artistically significant collection augments and contextualises the local performing arts materials in our collection. Striped beige and cream silk bodice, joined at the back with twelve mother-of-pearl buttons and featuring extensive use of cream coloured lace, particularly at the cuffs of the wide sleeves. 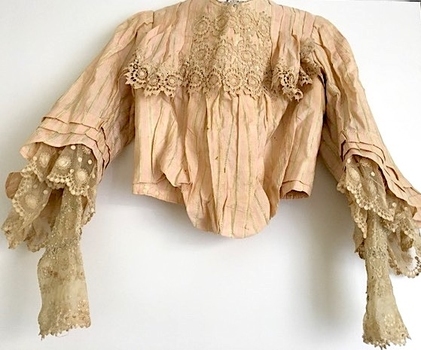 There is an inner sleeve of lace as well as an extended ruffle of lace extending from the cuff. The bodice has a floating panel at the front, which is bordered with lace. The lace extends in a wider panel to the round neck. An item forming part of a collection of costumes, photographs and documents relating to the Weir family who lived in the mansion originally named Illapa, 84 Princess Street, Kew, from c.1917 to 1950. This historically significant collection includes items relating to both George Weir (1866-1937) and his wife Edith Mary Weir (1867-1948). George Weir attained national prominence in the mining industry, becoming General Manager of the North Broken Hill Silver Mining Company in 1903 (later renamed North Broken Hill Mining Company 1905-12, and North Broken Hill Ltd 1912-1988), and subsequently President of the Mine Owners Association. He was to remain General Manager of North Broken Hill Ltd until his retirement in 1926. 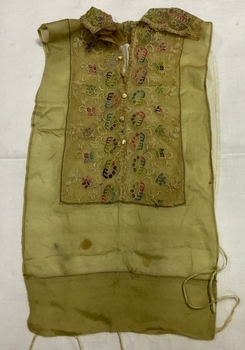 This garment is significant as it is part of 25-piece collection of women’s clothing owned by Edith Mary Weir (nee Betteridge), who was born in Clare, South Australia in 1867 and who died in Kew at the age of 81 in 1948. The items of clothing in the collection date from the 1880s to the 1940s and constitute outstanding examples of dressmaker’s skills from each of these decades. The collection includes day dresses, evening dresses, evening coats, capes, and undergarments. 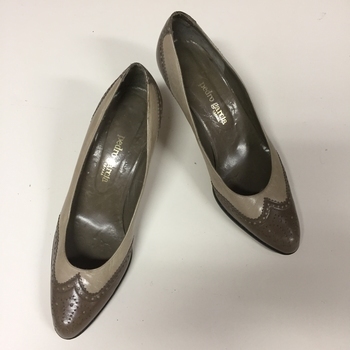 As the wife of a mining engineer, and later mine manager, Edith Weir’s clothing has historic significance as examples of clothing worn by upper middle class Australian women in domestic circumstances and at social and civic events. The costumes in the collection represent the periods when Edith Weir lived in Broken Hill, New South Wales, and in Kew, Melbourne. A number of the costumes from the 1920s to the 1940s are of a particularly fine quality, being both rare, representative and intact examples of Australian fashion of the period. The garments in the Weir Collection were donated to the Kew Historical Society by the granddaughter of Edith Weir. 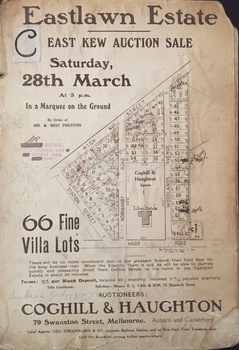 The ‘Eastlawn Estate’ was surveyed and ready for auction in March 1914, three months before the outbreak of World War I. Sixty-six allotments, created on the ‘order of Mr & Miss Preston’ surrounded the mansion of Woodlands in Harp Road. Woodlands formed part of the Estate, being advertised as lot 1. The allotments faced High, Station and Wright Streets, Harp and Normanby Roads, and Woodlands Avenue. Pru Sanderson in the Kew Conservation Study (Vol.2, 1988) wrote that the Eastlawn Estate ‘covered the western half of the failed Harp of Erin Estate’. Contemporary advertisements promoted the Eastlawn Estate as: ‘There will be no more convenient district nor pleasant Suburb than East Kew for the busy business man. When the Electric Tram is laid, he will be able to journey quickly and pleasantly direct from Collins Street to his home in the Eastlawn Estate in about 20 minutes’. The actual plans of subdivision were included in advertisements in The Argus and in the local newspapers. Subdivision plans are historically important documents used as evidence of the growth of suburbs in Australia. They frequently provide information about when the land was sold on which a built structure was subsequently constructed as well as evidence relating to surveyors and real estate and financial agents. 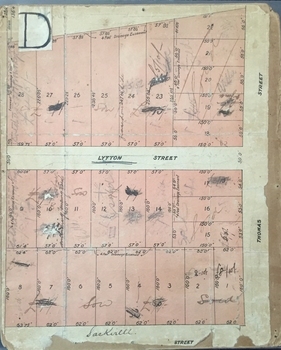 The numerous subdivision plans in the Kew Historical Society's collection represent working documents, ranging from the initial sketches made in planning a subdivision to printed plans on which auctioneers or agents listed the prices for which individual lots were sold. In a number of cases, the reverse of a subdivision plan in the collection includes a photograph of a house that was also for sale by the agent. These photographs provide significant heritage information relating house design and decoration, fencing and household gardens. "C" top left. Various annotations. 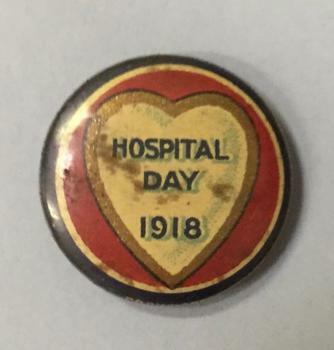 Small circular pressed tinplate badge featuring the words “Hospital Day 1918’ on a white heart overlaid on a red ground. The badge is bordered in gold. 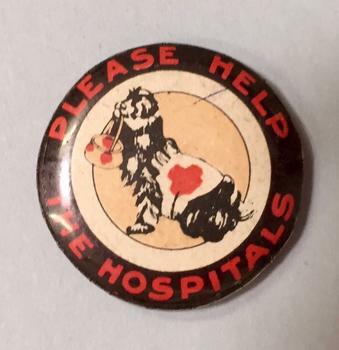 Hospital Day badges were sold for fundraising purposes during and after the First World War (1914-1918). Most of the civic and sporting ephemera assembled by Francis Rigg were patriotic buttons. The use of these buttons as a means of raising revenue through patriotic sentiment occurred soon after Australia pledged allegiance to Empire. Buttons reflected ‘public sentiment, courage, patriotism, generosity and several [un- named] virtues’ such as the martyred mother of a ‘fallen’ hero. Attention was paid to attractiveness of design, encoded symbolism and high quality of production. Expressing ‘loyalty’, they were tokens to be kept for perpetuity. Female labour was used to operate the die that compressed the tin backing, photographic print and celluloid cover together. The pin was applied by hand. Women, of all ages, entered into the spirit of voluntary sales. Often they were sold at the entry and exit points of major pedestrian thoroughfares. The women of Kew set up a kiosk in front of the Post Office and the Railway Station to solicit their round, oval and square shaped wares. Pride in salesmanship was affected by publishing the name of the woman and her fiscal achievement in the major newspapers of the day. The buttons form part of a collection of ephemera assembled by Francis Horace Rigg (19/10/1882-05/03/1946) of 50 Belford Road, Kew (Vic.). Frances Rigg was a local business identity in Kew, ultimately managing the local branch of the English, Scottish and Australian (ES&A) Bank at 175 High Street, Kew from c. 1920 until the 1940s. After Francis Rigg’s death, the collection of buttons and medallions was inherited by his son, Ken Rigg (14/11/1922-19/01/2014). The collection was subsequently donated to the Kew Historical Society in 2015 by his grandson Adrian Rigg at the time of the Gallipoli & Beyond Commemoration. The collection covers a period of almost 40 years. The majority of the buttons are patriotic buttons, issued and sold during and immediately after the First World World War (1914-1918) to raise funds for national and overseas causes. The collection also includes a number of locally significant sporting event buttons and sporting club medallions, issued in the 1920s and 1930s. Photographs accompanied an article in ‘Table Talk’ in October 1916 on the sale of buttons labelled ‘Please Help the Hospitals’ . The Commonwealth Button Fund supported the appeal. In the photographs, all of the collectors are holding tins with the Red Cross logo on them. The actual fundraising button depicts a dog with a basket in its mouth. The dog has a red cross on his coat. 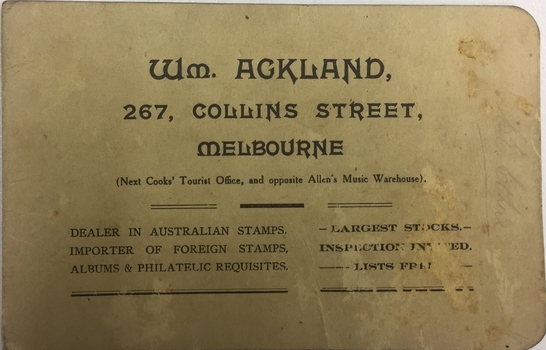 Paper and cellophane holder for stamps retailed by William Ackland of 267 Collins Street. The front of the packet contains advertising information about the seller. The reverse includes printed calculators. 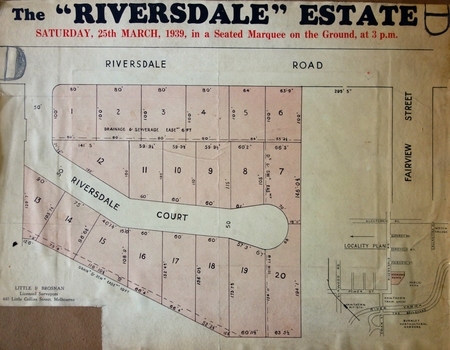 Lithographed subdivision plan for an un-named estate with 28 allotments facing Lytton, Sackville and Thomas Streets in Kew. The land would have originally formed part of the Dumaresq Estate. 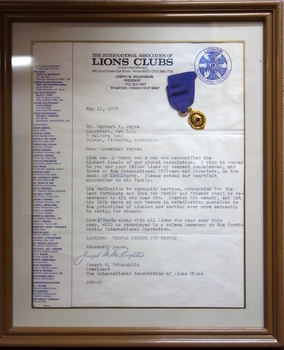 Framed Lions Club Letter and medal - Framed letter on the Letterhead of the International Association of Lions Clubs dated May 18, 1978. The letter is from Joseph M. O’Loughlin, President, The International Association of Lions Clubs to Mr Herbert Joyce, Secretary Kew L.C., 4 Belmore Road Balwyn. The letter commemorates the service of Lion Lou L’Hardy. The gilded medal on a blue ribbon is attached to the certificate. Rectangular silk organza chemisette, with inset embroidered net at the front and at the neck. The free-form, multicoloured silk embroidery includes abstract flowers, fruit and leaves, and may be of Chinese origin. The chemisette has five decorative mother-of-pearl buttons at the front and silk organza ties at the waist. 1 Princess Street, Kew: 7 Storey Office Building. High rise development in Kew Junction. Laminated real estate advertisement. See copyright information below. 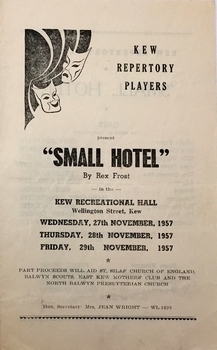 Programme issued by The Kew Repertory Players for a performance of Small Hotel by Rex Frost. The performances took place in the Kew Recreation Hall in November 1957. The 4-page programme includes a cast list, a synopsis and advertisements for local businesses. The Arthur Dear Collection is a comprehensive collection of theatrical ephemera relating to performances by theatrical and musical organisations from within and outside the former City of Kew who typically performed at venues in Kew during the 1950s and 1960s. 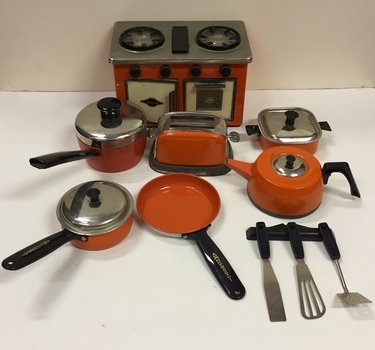 Miniature kitchen stove, cooking utensils and implements. Made of metal and enamel. Orange and black. Eight pieces. 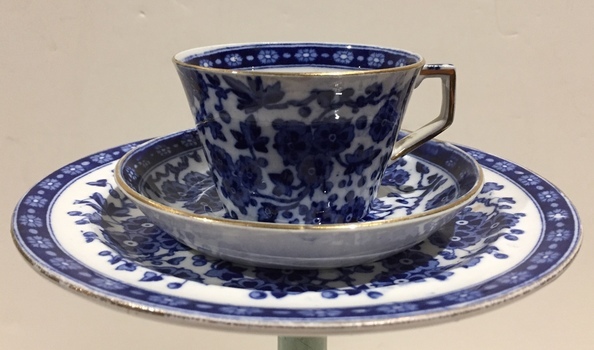 Glazed earthenware tea cup, saucer and plate with transfer printed decoration, using the 'Hawthornden' pattern by Ridgways. 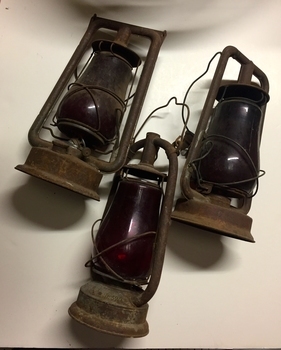 The underneath of each item bears the maker's mark and a pattern registration date for April 1880. 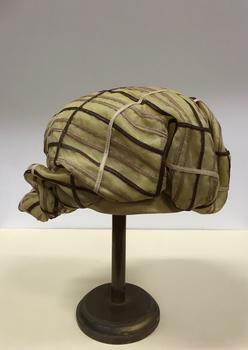 Pale green silk woman’s hat in a soft unstructured style retailed by Anne Harrison of Kew. The hat is banded with braid in contrasting colours. It has a soft bow at the rear. Archive file containing an extract from a Boroondara Bulletin (2016) outlining community feedback on the concept for a wetland at Chandler Park in Kew. Theatrical programme for a production of San Toy in the Kew Recreation Hall by the Kew Light Opera Company. The 4-page programme includes profiles, a cast list and advertisements. The Kew Light Opera Company was formed in 1952. Its first production, held in the Kew Recreation Hall was Leslie Stuart's Florodora. In 1957, the Company was subsumed in the "Q" Theatre Guild. 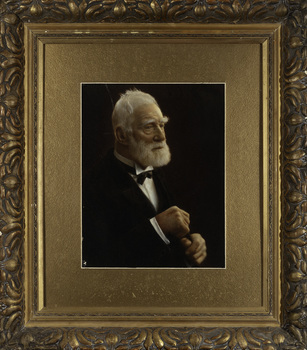 Hand tinted photograph in a gilt frame of the Kew pioneer James Venn Morgan (1823-1923). The first reference to the pair of Morgan portraits, of which this is one, occurs in the Society's minutes in 1978, in the context of the conservation of the portraits, which may have entered the collection at an earlier date.